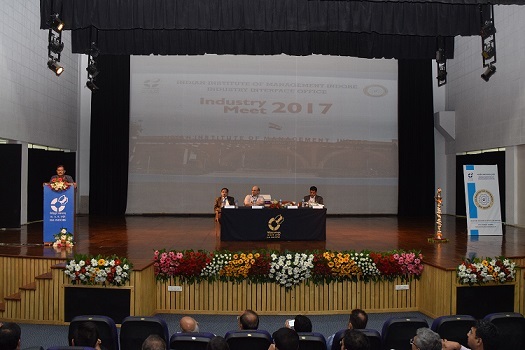 The Annual Interactive Event for the industrialists from the region and adjacent areas—Industry Meet 2017 was held at IIM Indore on June 24, 2017. 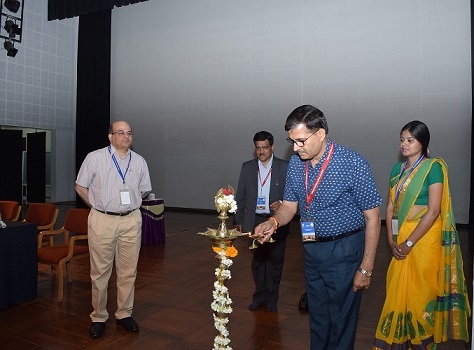 The event witnessed over 250 industrial leaders and specialists from numerous sectors, sharing their experience and knowledge with a huge gathering comprising of budding entrepreneurs, scholars, young managers and the students and faculty of IIM Indore. Mr. Ashwani Lohani, Chairman and Managing Director, Air India Ltd. was the Chief Guest for the event. The objective of the meet was to understand the changing paradigms of the industry needs and accordingly change the curriculum for the participants. 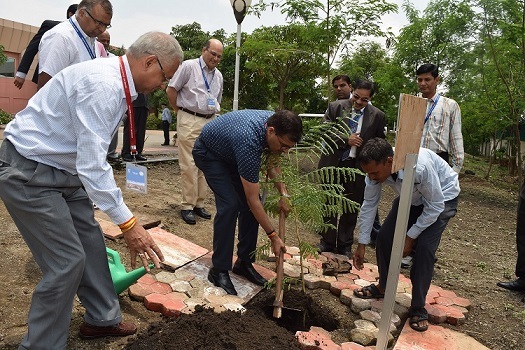 The event began with the formal lamp lighting ceremony by the Chief Guest, along with Mr. Satish Nadiger, MD & CEO, John Deere; Professor Rishikesha T. Krishnan, Director, IIM Indore and Professor NMK Bhatta, Chairperson, Industry Interface Committee and Faculty, IIM Indore. Professor Bhatta welcomed the dignitaries and gave a brief introduction of all the guests. 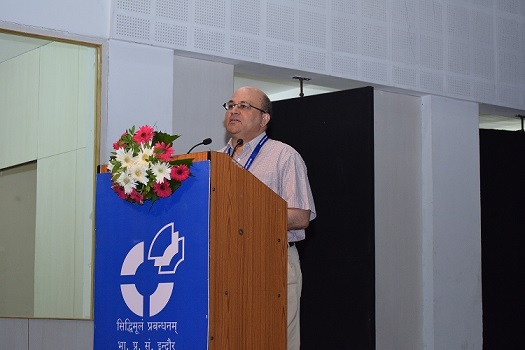 Professor Rishikesha T. Krishnan then addressed the gathering and shared his views on IIM Indore and its Industry Connect. He said that the purpose of Industry Interface Office is to connect with the industries not only with regards to executive educational programmes, but also to modify the curriculum for diversifying students’ knowledge. ‘The first year students have Industry Interface Programme, under which 95 projects were taken by the participants during the last year. This not only gives an exposure to the participants, but also helps the industry to find various solutions for the problems faced by the organization’, he said. He also discussed about the Expert Talk Series and various other initiatives taken by the students to enhance industry connect. This was followed by the talk by Mr. Ashwani Lohani on the topic—‘Managerial Excellence in a Challenging Environment’. He began his speech appreciating the Industry Meet initiative and mentioned that such events help the students learn at a stage when they can easily grasp and quickly enhance their skills. 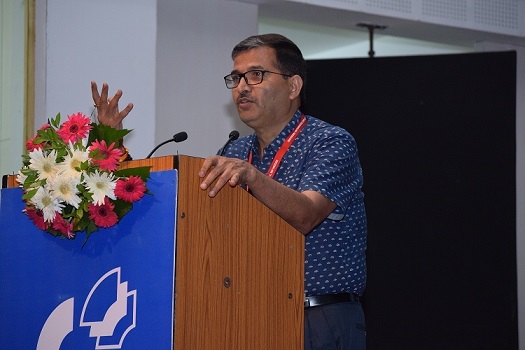 Addressing the gathering and sharing the importance of human values Mr. Lohani said, ‘Before you jump to a conclusion and take a move ahead for your career, ask yourself, what is the purpose of your life? Do you just wish to be successful and famous and earn money; or you really want to develop as a human being?’ He advised the students to understand that life is beyond great lifestyle and enjoyment—and we need to identify the true-self and take our aims forward slowly and steadily, getting over the setbacks and remaining strong. ‘Every youngster today wants to reach a top position in the sector he/she works in. Attaining a top position isn’t worthy, if you don’t use that position and power for the welfare of the society’, he said. Discussing about failures and fears, Mr. Lohani said that every successful person is successful because he chose the path less chosen. ‘Most of us fear taking decisions, taking a path no one previously went ahead with, fear of losing or being harmed. But we need to learn to conquer our fears and be strong—create a world where the mind is without fear and the head is held high’, he quoted Rabindranath Tagore. He encouraged the students to become successful managers, but also advised them to try and become inspirational leaders who encourage the employees, don’t have ego and listen to the inner voice which gives genuine suggestions. His talk was followed by a Q&A session. Professor Bhatta then presented a report on Industry Interface Programme 2016-17, which was followed by felicitation of the Industry Partners for the programme. This was followed by a presentation on ‘Make in India’ by Professor Ganesh Nidugala, Faculty, IIM Indore. The presentation laid foundation for the Panel Discussion on the topic—‘Enabling Make in India: Next Steps’. 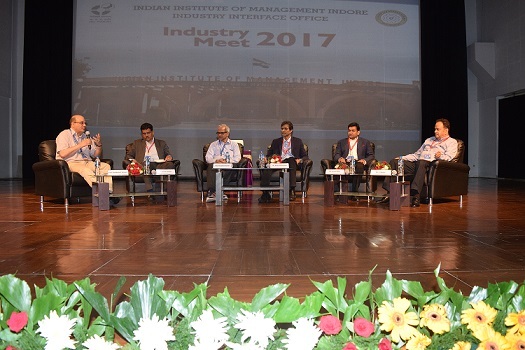 Moderated by Professor Rishikesha T. Krishnan, the panel discussion had Mr. Satish Nadiger, MD & CEO, John Deere; Mr. N Mohan, CEO, Aerosoles Europe (subsidiary of TATA International); Mr. Anshul Mittal, Chairman, CII, MP Region; Mr. Aditya Shrivastava, Sr. VP, Volvo Eicher, Indore; and Professor Ganesh Nidugala, Faculty, IIM Indore as the panelists. The discussion revolved around how Make in India is affecting the employment, economic growth and skill development in the country. Aditya Shrivastava noted that with the increase in mall culture and ecommerce trends, workers are getting better working environment and organizations are now attracting talents towards manufacturing sector as well. However, retaining employees to work is a big challenge and customer satisfaction also needs to be ensured. Mohan while discussing about the challenges being faced by his company noted that women employment is also a way of women empowerment today. Empowering employees can be efficient with the change in mindsets and perceptions and efficient training of the employees. Nadiger said that with the revolutions taking place globally, attracting qualified and skilled youth is a big challenge. Anshul Mittal discussed about how the quality and productivity of any organization is affected by employee attitude and mindset and how automation has affected every industry in the last decade. Professor Ganesh Nidugala noted the impact of global economic conditions on Make in India. Professor Krishnan then concluded the discussion, which was followed by Q&A session. Mr. Somil Bajpai, Industry Interface Officer, IIM Indore delivered the vote of thanks. 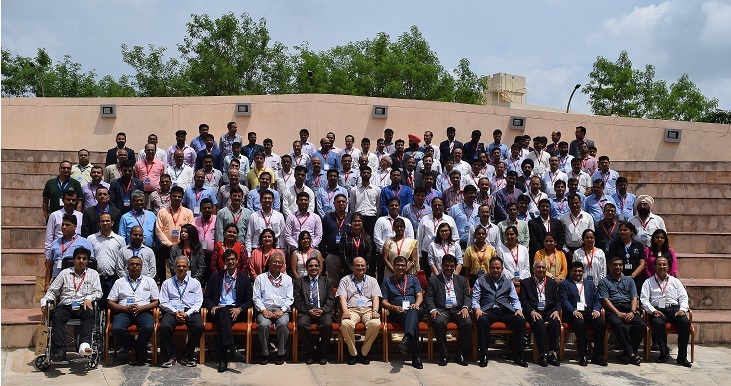 The Industry Meet came to an end with all the participants, industrialists, budding entrepreneurs, faculty and experts exchanging knowledge and gaining inspiration from each other’s success stories.